The Beauty of Life: Beauty Question: What Nail Polish Are You Wearing Today? Beauty Question: What Nail Polish Are You Wearing Today? Fess up, fellow beauty chicks -- what nail polish are you wearing today? 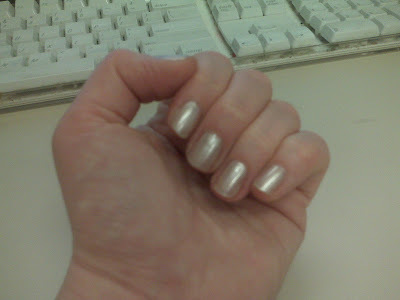 I'm sporting Laura Mercier Nail Lacquer in Sterling Silver -- maybe a bit too holiday, but hey, I don't mind bringing the bling a little early! Let me know your polish choice in the comments! Rescue Beauty Lounge Recycle over here! OPI My Private Jet! Love it! Illamasqua Phallic. I love the deep blue and have received many compliments on it! But there seems to be some tip wear after a day of wearing, boo! I WISH! I just bought an Essie warm brown and haven't had time to put it on! Will hopefully get to it this weekend because my nails need some major help!